Anghiari is a beautiful medieval village overlooking the Tiber river valley (Valtiberina) and the course of Sovara river. The powerful walls, much of it is well preserved, it gives the town a particularly attractive appearance. The old town is characterized by Renaissance palaces, picturesque stone houses, narrow streets. There are many small churches, many of them from the Middle Ages. 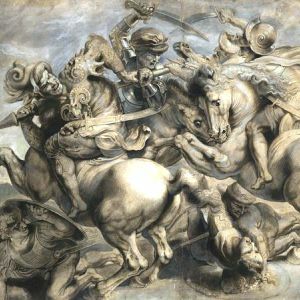 The town is also famous for the bloodless battle fought nearby, then reproduced in fresco by Leonardo da Vinci (Battle of Anghiari) painting unfortunately lost. Traditional activities are the restoration of furniture and crafts, mostly firearms, wicker baskets, wood and wrought iron. 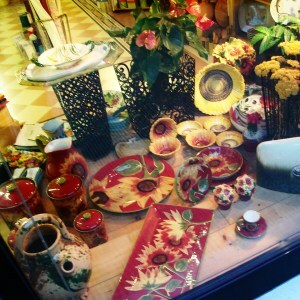 The old town is full of small shops of artisans, among which ceramics, decorations, fabrics. Also numerous antique dealers, all accompanied by skilled restorers. Nearby there are many well-preserved castles such as those of Sorci, Montauro and Galbino that still bear legends of ghosts of the previous owners. For diversity and excellent conservation of the historical and artistic heritage the town has been awarded the “Orange Flag” confirming the excellent quality of the tourism facilities. Anghiari seat of the Free University (www.lua.it). Since 2006 there are held two major events: the Cyborg Film Festival, a series of science fiction films, and the “Premio Anghiari – Words, Colors, Sounds”. A first fort was probably built already in the Lombard period. Would confirm the name, derived from the word Lombard sorku (brooms forest). A wider fortified structure, dating from the twelfth century, it was partially destroyed in 1268 during the invasion of Italy by the Emperor Conrad of Swabia. At the beginning of the fourteenth century it became property of Tarlati family of Arezzo. It was then included in the territory of Florence and, in the first half of the fifteenth century, it became the residence of Baldaccio Bruni, described by writer Niccolo Machiavelli “most excellent man in war, because in those days there was no one in Italy by virtue of the body and mood that exceeds him”. In later years the castle was the subject of countless renovations. Since the 70s of last century, the structure has experienced new life for the commitment of the current owner Primetto Barelli. Here, the actors Roberto Benigni and Massimo Troise drew inspiration for the screenplay for the film “We just have to cry.” The property is equipped for weddings, parties, meetings, conferences. Inside there is also “La Locanda”, a well-known restaurant frequented by celebrities. Baldaccio was killed for treason in 1441. Her ghost is still heard wandering the halls of the castle. Someone perceive its presence through the chains dragging noises, or armor that is constantly changing location or by a piano that makes sounds without anyone touching it. The castle was built between 1180 and 1190 on the ruins of an earlier Lombard fortress and took the mountain name rather fraught where it is located: Monte Acuto. In the thirteenth century it stayed there several times St. Francis of Assisi on the occasion of his trips to La Verna. The small chapel was the site of the saint’s prayer, at the time only a young monk. The structure was subject to many changes over the years. In the fourteenth century it was already a fort with several towers and at least three city walls, which can hold 400 people. Almost totally destroyed during the wars between Arezzo and Florence, the castle was rebuilt in the sixteenth century, becoming a villa owned by the Barbolani family. In 1963 it was bought by Barbolani Montauto, descendants of the owners during the Renaissance. Besides the beauty of the building, it is remarkable view of the entire Tiber Valley. In summer there are numerous cultural events. 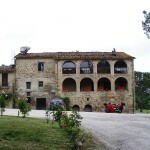 You can stay in the guesthouse of the castle or in adjacent buildings intended to farmhouse. It was built between the centuries XVII and XVIII and designed by Giovanni Battista Bellini. The plant is a Latin cross and a single nave is covered by a barrel vault. Interesting are the paintings inside: the monumental Last Supper (1531) and Foot Lavender by Giovanni Antonio Sogliani. Above the main altar is the work Deposition from the Cross (1515) by Domenico di Bartolomeo Ubaldini, said Puligo. Behind the altar there is the Madonna of Mercy, glazed terracotta of Andrea della Robbia shop located behind the main altar. 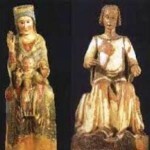 Another important work is a wooden sculpture of Tito Camaino, depicting the Madonna. 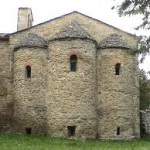 It is among the oldest churches in the Upper Tiber Valley, as dated between VII and VIII century. The overall look reminiscent of the Byzantine style but most experts believe that the building has been completed in the Lombard period. The square plan is closed by three semicircular apses. Inside, the columns are topped with Ionic capitals of the Roman era. A painting by Domenico di Michelino (XV century) depicts the Madonna and Child with Saints. It is distinguished by an unusual design solution that differs from the simple scheme of Romanesque churches. It was built in the thirteenth century, probably by the Camaldolese monks, along the road to Citerna, on the ruins of a pagan temple. 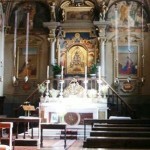 The main altar, dating from the seventeenth century, contains a fourteenth century fresco of the Madonna del Latte. The Abbey of San Veriano is located near the village of Toppole, consisting of houses built above the ruins of the ancient castle of Toppole. 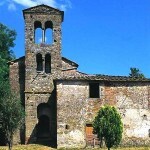 It is an abbey built in the late eleventh century and entrusted to the Congregation of the Camaldolese until 1360. The building is characterized by a nave with three semicircular apses. Under the presbytery there is a crypt which occupies about half of the church. The building was built in the eleventh century, initially with defensive function. In 1556 it was the subject of a radical transformation and the fort became a square villa with bastions, unusual appearance for a building. The interiors were enriched with Renaissance portals in stone and terracotta flooring. The villa is connected to the nearby Capuchin monastery by a straight road and flanked by cypresses. There are numerous protected areas established to protect unique ecosystems and of great value in the Tiber Valley. Two are located in the territory of Anghiari: the Golene del Tevere, caves immersed in the woods, and Monti Rognosi, rich in rare and beautiful natural scenery. Here live wolves, deer and roe deer, porcupines, badgers, foxes, and birds such as the hawk, the buzzard or golden eagles. The two protected areas are characterized by the presence of dark green color minerals, called ophiolites, or “snake stones” that change appearance depending on whether there is sun, rain or moonlight. 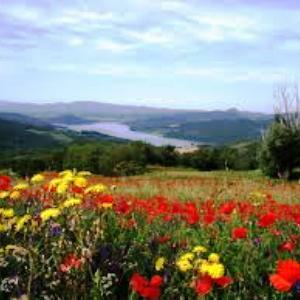 Also in the area are Montedoglio Lake and wetlands, derived from abandoned alluvial quarries and with various types of habitats. The trials are easy practicability. The museum is located inside the Taglieschi Palace which was built incorporating some medieval tower-houses. Their tracks are recognizable in the windows, in the large warehouse and in the stone floor. The museum contains works of art of great value: architectural fragments, frescoes from the palaces and churches of the town, church ornaments, tools, an organ of the first half of the sixteenth century still working and popular devotional objects of the high valley of the Tiber. Among the most valuable works a Madonna and Child (1420), polychrome wooden statue attributed to Jacopo della Quercia, a Nativity, glazed terracotta from the workshop of Andrea della Robbia, and the Samaritan woman at the well of Benedict Buglioni. It is located inside the Palazzo del Marzocco, built in the sixteenth century through the renovation of two medieval tower houses. 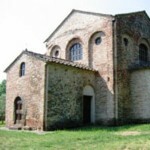 Inside are relics from the surrounding area Anghiari, from prehistoric times until the eighteenth century. Contains prehistoric lithic objects, Roman artefacts, fragments of sculptures of the Middle Ages, ancient manuscripts, glazed pottery and firearms produced by local craftsmen in the eighteenth century. Particularly precious is the head of the god Pan, in rock crystal sculpture dating from around the second century A.D. A large section is dedicated to the battle of 1440 and the work of Leonardo da Vinci. The event tends mainly to enhance the work of the artisans. The event includes all sectors crafts, from antiques to the manufacture of iron and pottery, the carved stone to precious metals, leather, all objects present in the characteristic shops of the historic center. Routes can be carried out together with the environmental guides. 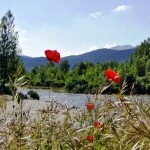 Also possible are some thematic routes in other areas such as the Franciscan places, the water way and Val Sovara. 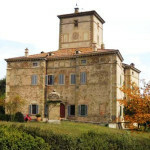 Historic houses – guided hike in the mountains Rognosi the discovery of the ancient county of Barbolani Conti .. The Etruscans were the first frequenters of the territory, attracted by the presence of iron in the subsoil. Later it became a Roman settlement. After the end of the Empire, the Byzantines and, soon after, the Longobards settled there. The latter, presumably in the 7th century AD, built an ellipsoid-shaped castle. The territory began to be more populated in the IXth century when the whole area was the object of fortifications in the most strategic points of the Sovara valley, of the Tiber and of the Singerna. 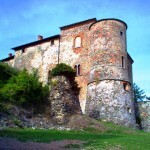 In particular, the Castle of Montauto, that of Galbino and that of Sorci are the most significant and best preserved examples of the first forts. The original nucleus of Anghiari, a fief of the lords of Galbino, was certainly already constituted in the middle of the 11th century. A century later the Camaldolese monks contributed to the expansion of the settlement. 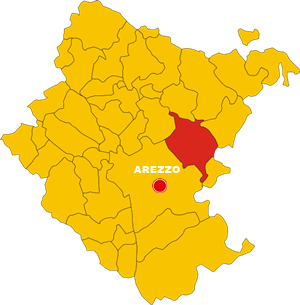 In 1175 the militia of Arezzo attacked and destroyed the village, but a few years later the city favored its reconstruction, including a strong city wall. The decisive expansion of the village took place in the first half of the fourteenth century, when the Tarlati family of Arezzo built the Loggia with the sources, located under the current Piazza Baldaccio, and the long road in the direction of Sansepolcro. At the end of the century the dominance of Florence was consolidated on the town, which also established a vicariate here. 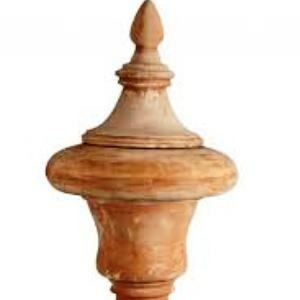 Of this period there are many Renaissance architectural elements. 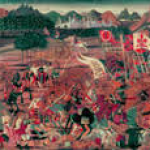 In 1440 the armies of Florence and Milan faced each other near the town: it was a battle with practically no bloodshed. In fact, the Florentine militia succeeded in blocking the adversaries’ advance towards their city. 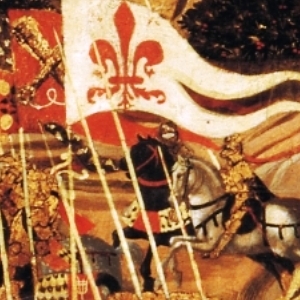 At the beginning of the XVIth century there were some episodes of resistance to the dominion of Florence, now firmly controlled by the Medici family, without however that Anghiari succeeded in recovering its independence. On the other hand, at the time of the establishment of the Grand Duchy of Tuscany, the town expanded its territory beyond the course of the Tiber. 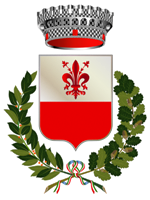 Subsequently Anghiari followed the historical events of this state until the Unification of Italy. Near Anghiari stands the castle of Sorci once home to Baldaccio Bruni who died on September 6, 1941, killed by treachery by those same people whom he considered friends and who instead atrociously beheaded him in front of Palazzo Vecchio in Florence. From that horrendous day, it has been said that on the day of his death Baldaccio’s spirit wanders in the castle, perhaps to remind everyone of the injustice of his death. The mystery on this apparition is strong, since according to the legend the spirit of Baldaccio Bruni is seen as he died and that is without the head. Another mystery is related to the noise of rattles that often is heard inside the castle, and that the origin is unknown. Today the castle has been transformed into one of the most popular restaurants in Italy, a destination for people in sight who go there even perhaps hoping to hear or see something. The scenario is still suggestive. The castle with the spectrum of Baldaccio served for the setting of the interiors of the film ‘We’ll just have to cry’ with Benigni and Troisi. 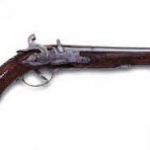 Between the 18th and 19th centuries, Anghiari was one of the most appreciated centers of production of firearms: they were distinguished by the refinement of the carvings on the mechanical parts and the incredible richness of the decorations. Often these decorations were obtained with agemine, an ancient technique that allowed garish multicolored effects through the incrustation of precious metals on the more humble ones, appropriately chiselled. Subject of numerous specialized exhibitions, the firearms of Anghiari are considered extraordinary works of art for the skill with which they were made. Produced once extremely appreciated – and for this reason exported to other regions – the ford is a dye extracted from a plant cultivated throughout the Valtiberina, which gives the fabrics indigo coloring. 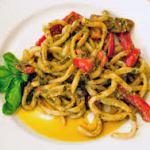 The grinding of the leaves took place in the mills and the pasta obtained from it was left to rest for a few days and then dried in loaves. At the time of use, the ford was dissolved in boiling water like a soap. 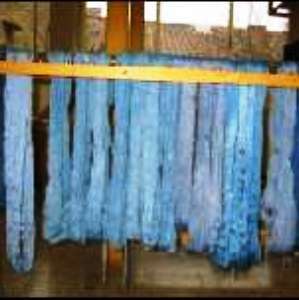 Unfortunately, the advent of chemical dyes made this type of processing long forgotten, even if, recently, there has been a growth of interest for this natural dye. Many families still keep pots, pans and warmers, the result of another tradition of craftsmanship. The typicality of this production resided in the characteristic color, obtained by milling black pebbles used to obtain glazes for terracotta. It was the manganese nodules, rich in metal, abundantly present in the territory. When the clay was cooked, it followed the coloring phase with water and manganese paints, which gave a red or black color. The tradition was then extinguished in the middle of the twentieth century, but, for some years, some enterprising artisans have recovered and revalued what was one of the major activities of the territory. They are big handmade spaghetti with flour and water seasoned with porcini mushrooms from the woods of Valtiberina or with meat sauce of the “Chianina” breed. 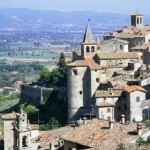 Anghiari dedicates to bringoli the last event of the calendar of annual events .. The Feast of San Martino and Bringoli is held since the beginning of the 80s in the second weekend of November, the one that usually coincides with the anniversary of San Martino . A family of artisans has maintained the centuries-old tradition of working wicker harvested along the waterways, creating objects for a market that is not only local. Given the demand, the wicker is also grown in plantations. 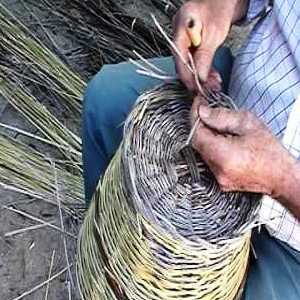 When the stems are dry the work of the basket maker begins, starting from the intertwined ribs that baste the base, and then proceed with the weaving until the final border, so as to make baskets, baskets, upholstered chairs. Among the great craft traditions of the town there is undoubtedly the teleria. At the end of the 18th century began the production of fabrics and lace of wool or hemp. 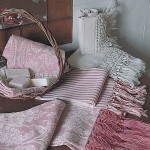 The textile tradition found the best interpreter in Livio Busatti who, at the beginning of the last century, entrusted the production of fabrics to the rural housewives. The entrepreneur set up a small workshop and a first commercial network that would have brought the family’s name to over fifty stores worldwide. In recent times the quality fabric has been favored, made exclusively with natural fibers such as hemp, linen and cotton, and completed with motifs and colors taken from tradition.